BROMSGROVE’S Stage Door Dance Academy has celebrated its 13th anniversary with its members taking part in the successful All and Sundry pantomime Cinderella. The sell-out show took place at Artrix in the run-up to Christmas. Martina Ponsonby is the Principal of the Stage Door Dance Academy which has been based at Stoke Prior Village Hall since 1994. She said: “A pantomime is not the same without children appearing in it and we were delighted to have a great group of students performing in this production. “We are tremendously proud of our students who worked so hard throughout rehearsals and the extended run of the panto. She said events such as the pantomime created wonderful lifelong memories, gave participants dance and performance experience and saw great friendships forged. 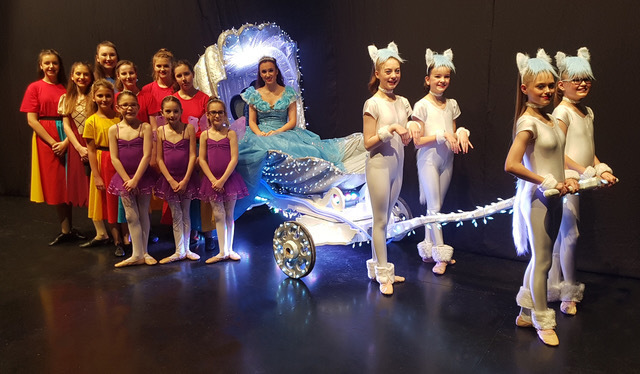 This year’s pantomime was particularly special for the dance academy’s senior student and assistant Laury Wiggins, who took centre stage as ‘Cinderella’. “Laury first made her debut appearance with All and Sundry in the January 2007 production of Cinderella when she played a Sprite at the tender age of seven and has been in the panto every year since. “From there to appear as the Principal was a wonderful journey for her,” added Martina. She also praised the school’s strong support network, along with the parents, former students, friends and colleagues who were involved in the production. Call Martina on 01527 577594 for more information on the academy.